Life’s too short for bad coffee. My home, for probably something like thirty plus years, has been an instant coffee free zone. I’m firmly of the belief that there’s no such thing as instant coffee: instant it may be, but coffee it ain’t. So, over that period of time I’ve employed a number of different coffee makers, and different ways of getting my coffee. Drip feed, with carafes of varying capacities. Espresso machines. Bean roasters. Single cup filter holders. Percolators. Plungers. Manual cappuccino machines. And fully automatic cappuccino machines. I’ve even had one machine that was a combo system: drip on one side, and espresso on the other. On reflection, that was a pretty good system. But while they all made somewhat good coffee, these were all also fairly high maintenance systems. Plunger systems required proper cleaning, and careful disposal of the used coffee grounds. Filter systems were slightly less troublesome, but they usually required me to make coffee for eight or ten cups/people. Living on my own, that’s perhaps a little more than I really wanted to make. Making smaller quantities was troublesome; larger quantities was either wasteful, or led to burnt and stale coffee. That’s about as unpalatable as instant coffee. I’ve found that many espresso and cappuccino machines were messy, difficult to use, you needed to wait for them to warm up, grind some beans, spill some ground coffee somewhere, coffee might be spilled on your work surfaces … and if you wanted to froth milk, that was still more mess and trouble. And with many of these systems, I’ve found that the coffee has not been anywhere near hot enough. What’s with that? All good fun though, if you didn’t mind the hassle, and had the time and inclination for doing all of this. But what if you didn’t? What if all that you wanted to do was take just a minute and make yourself a cup of flavourful coffee? 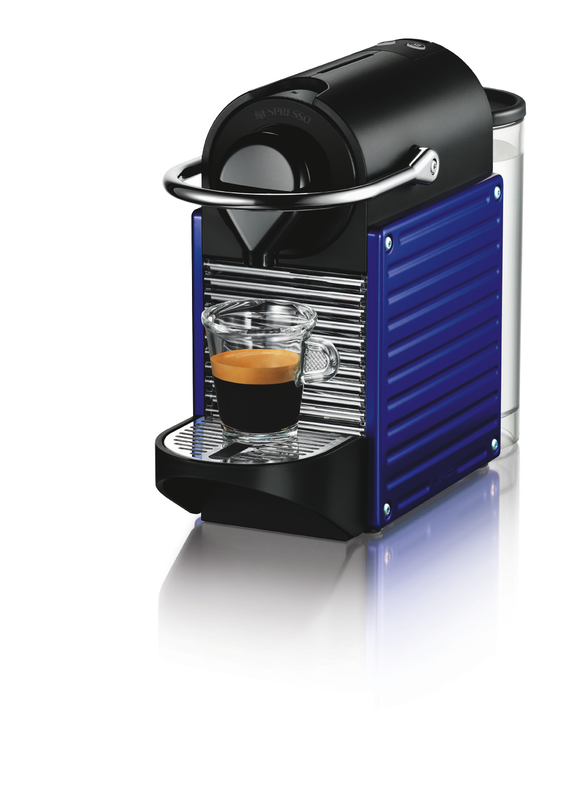 Instant was never the answer, so enter the Nespresso Pixie system. Over the last few years I’ve only had a casual exposure to the Nespresso system; this is the first time that I’ve actually had one in my home. The Pixie is tiny. Truly tiny: it takes up just a few square inches of your kitchen benchtop space. Much smaller than almost every other system that I’ve used. But while it’s not automatic, it’s got to be the easiest cup of real coffee that I’ve ever had the pleasure to have made. Turn it on, drop a pod into the pod bay (seriously) close the pod bay, put your cup under the nozzle, and start the coffee making process by pushing a button. Wait about thirty seconds, and you’re done. And it’s pretty well mess-free. After use, the pods drop into a collection bin behind the serving nozzle. This bin easily pulls out to let you dispose of the used pods, and also give it a quick rinse to take care of any drips that might accumulate from the pods after their use. Ok, it’s small. It makes good coffee. It’s easy to use. It’s fuss free. And it’s also basically mess-free. Anything else? As it happens, yes: it turns itself off after about ten minutes of not being used. So, in these times where we are all looking for ways to save power, if you forget to turn the Pixie off, it will turn itself for you. Given it’s diminutive size but impressive capabilities, this would not be out of place in a caravan, boat, or one’s holiday home. So, if you’re looking for a one touch solution to the problem of making yourself a quick cup of coffee, the Nespresso Pixie would be a great place for you to start looking.